Choosing the right material for an employee award can be difficult. To make this decision easier, we have taken the opportunity to compile a short guide providing you with the information you need to make the best selection. This article will focus on glass and art glass. The glass is referred to as “float glass” because it is made by “floating” molten glass on a bath of molten metal. When the glass flows onto the metal’s surface, it produces a floating ribbon of glass that has perfectly smooth sides and a uniform thickness. The glass hardens as the ribbon’s temperature is slowly cooled down. The glass is, then, passed through a kiln to anneal it and prevent it from cracking during temperature changes. The glass usually arrives in a large sheet, which we can cut down to different sizes and shapes. Typically, the glass is between .375” and 75” thick. While the majority of glass awards are clear (frequently referred to as Starphire) or jade, with a light green tint, glass can also be found in black. Glass can be formed into an assortment of shapes, such as plaques, pillars, stars, and much more. A parison (a molten blob of glass) is attached to the end of a blow pipe’s long tube. While blowing air into the glass through the pipe, the artist spins the glass into various shapes. Moving the blow piece around allows the glass to cool down enough to be shaped into various objects. The artist has the option of adding color pieces to the glass to create a variety of colors. Glassblowing is a complex process that requires 3 glass furnaces, included one to hold the molten glass, the second to reheat the glass so it can molded into different shapes, and the final one, referred to as the annealer, which allows the piece to slowly cool down. Art glass awards are created by hand one at a time. They are truly a one of a kind piece that can be created in assortment of shapes, sizes, and colors. 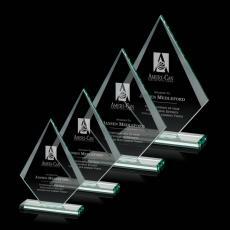 Learn more about art glass trophies. 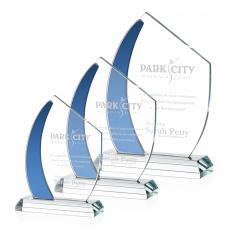 If you are in need of stunning glass awards for your employees, Awards.com has a wide selection to choose from. If you have any questions, please contact us at 1-800-4-Awards (1-800-429-2737).